The bandsaw. I was introduced to this woodworking machine some time ago as the tool that every woodturner would need to get into the craft. 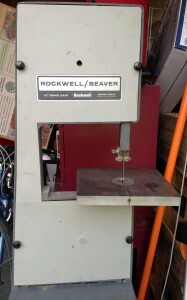 The bandsaw that I own is an 80 or so year old Rockwell Beaver 10 inch bandsaw, originating from Ontario, Canada. Perhaps 80 years ago my great grandfather bought this bandsaw and used it in his small apartment to aid in his woodcarving hobby. Before my great grandfather passed, he passed it on to my grandfather; my grandfather, not being a woodworker, used this bandsaw infrequently, but made an effort to repair and upkeep the machine. Later, my grandfather lent the bandsaw to his neighbor, a woodturner. My grandfather’s neighbor turns bowls, boxes, and all sorts of lathe related projects as a career and found great use in this bandsaw for cutting out bowl blanks from rough, green wood. My grandfather’s neighbor, at some point, purchased a larger 14 inch bandsaw and returned our 10 inch bandsaw to my grandfather. For years the Rockwell Beaver bandsaw sat in my grandfather’s garage, waiting for its next use by another woodworker. In the summer of 2014 my grandfather and I cleaned the bandsaw; we sanded the table flat, realigned the wheels, and cleaned the bearings. After doing this we bought the Highland Woodworking 3/8″ Woodturners Blade and spent some time properly tuning our bandsaw. The task took a serious amount of time to properly align and tension the blade and wheels. After doing this we cut our first pieces of wood. The saw cut through wood like butter! So, we brought out our first blank to be cut round. The blank was a 40% moisture content box elder blank. The bandsaw did not cut well due to its 1/4 horsepower motor. However, with the sharp blade and much time we had cut our first blank! I have since turned this blank on the lathe and the bowl turned out great! I’ve been using this bandsaw ever since, in tandem with my newer 14″ bandsaw. I’m very thankful of my grandfather, and great grandfather, for giving me this bandsaw. I have been woodworking for well over 2 years now. I first started making simple bird houses and toolboxes. Recently I made a bench, numerous bowls, and other small projects. I know that I will carry woodworking with me through the rest of my life. FYI, the saw is not nearly that old. Rockwell didn’t acquire the Canadian company that made Beaver branded tools until 1953.
you are so happy, I wish I could do such things with my grand father. Remember the time I felt I could do that. you should enjoy many more with your family.